I am planning a collection of very plain knitted items. The KISS collection will feature items that use stocking stitch only, except where necessary, e.g. ribbing at cuffs to prevent rolling etc. The first pattern in the collection will be these mittens. The mitts are worked top-down so that you can weigh your yarn and use exactly half. They’re long, so you decide when to stop. The thumb is worked with short rows to give a pleasing shape. KISS patterns will be plain, to show off your art and self-striping yarns to best advantage, and so that you can add the finishing touches you want to them. KISS knits may be plain, but they won’t be boring. Each will feature an interesting technique, such as the mitts’ short-row thumb, but there won’t be any lace, cabling or colour work. And because the main stitch pattern is stocking stitch, they’re gonna be fast, fast, fast. The KISS collection will also include a hat, jumper, cardigan and another accessory. 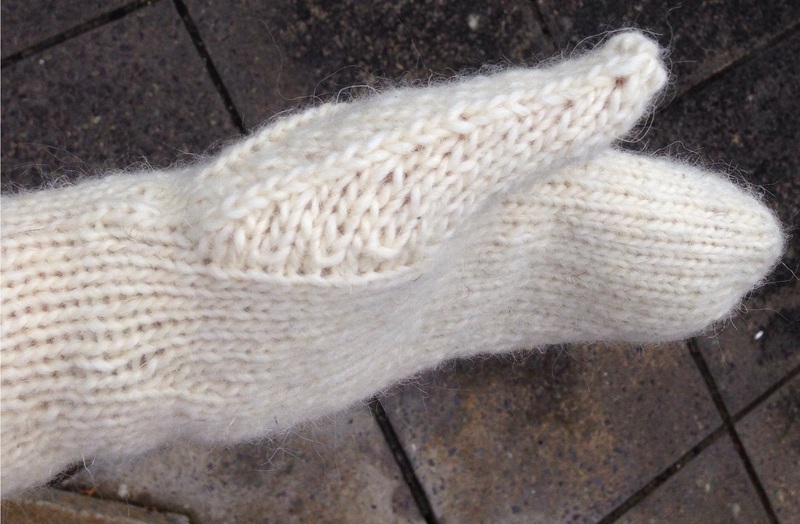 The KISS mitts use S Twist wool, the only yarn to be completely processed in Ireland. Found some in This Is Knit last week and had to have it for this pattern. Will write a review shortly! Posted in Upcoming Patterns	KISSKISS collectionmittss twist. Ok this is probably just me, but the way the mittens are long and the angle of the picture, I thought these were socks. And then I was like, but why does the sock have a thumb?! Weird feet! Um, yeah. Probably just me. But! I actually love long mittens. Looking forward to the review and more of your patterns. : ) thanks heather! Yes, not the best pics in the world – taken yesterday by my 6-yr old! I will post again when I’ve dine a proper shoot.